Inspired by the legendary VSM 201 Vocoder from Sennheiser Virsyn have spent Matrix an additional Filter module modelling the analog Sound of the VSM. But to make it even better they've extended the filter range by adding two additional filters for the high end and MATRIX got two Filterbanks for stereo operation. 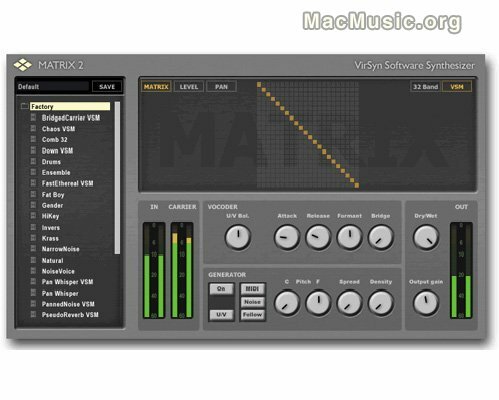 Matrix 2 also comes with a redesigned user interface, some additional presets and they've spent an internal noise generator for whisper effects. • Internal Noise generator added. • Redesigned graphical user interface. • New factory presets added. From now till April 30th, 2010 you can get Matrix 2 for €129 instead of €199.